My real name is Minaachimo-Kwe, while my English “pseudo-name” is Alice Olsen Williams. My mother’s doodem (clan) is the Caribou, but because my father is a white man (born in Oslo, Norway), I was not born into a Clan. However, the Martin adopted me into her Clan. I was born in Trout Lake, in Northwestern Ontario, the land of my mother’s people and relations from time before memory. I have been living now for the past forty-four years at Curve Lake (a First Nation between Ottawa and Toronto), where my husband and four children were born and raised. To date, we have 5 grandchildren and one 2½ year old great-grandson. I am a sovereign member of the mighty Anishinaabe nation. This is what I say when I introduce myself at ceremonies. If I’m with friends we have a good little chuckle about that. I am known for my quilts. 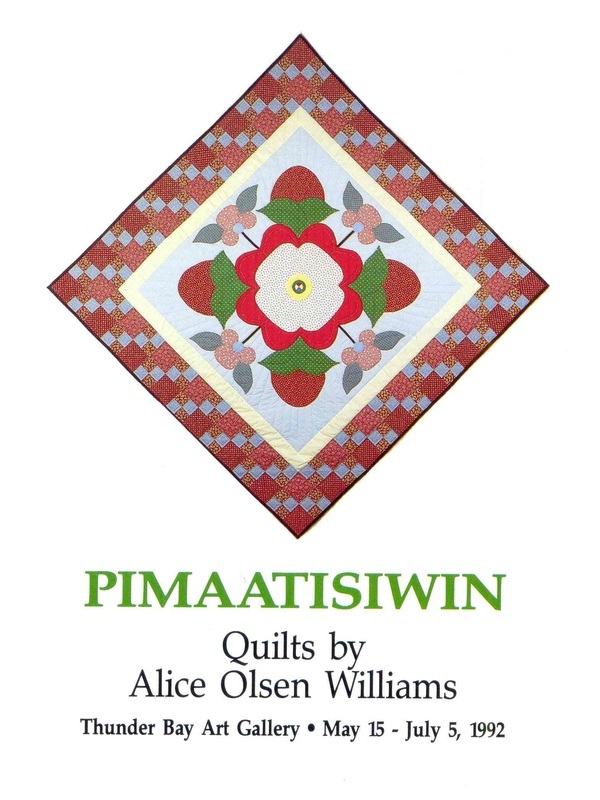 As a quilt-maker, I hope that I help to bring honour to women, as women in many cultures and down through the millennia have made blankets for warmth, comfort, beauty and expressions of love for their families, households, relations, ceremonies, and gifts. I did not always twig to quilts and quilt-making. 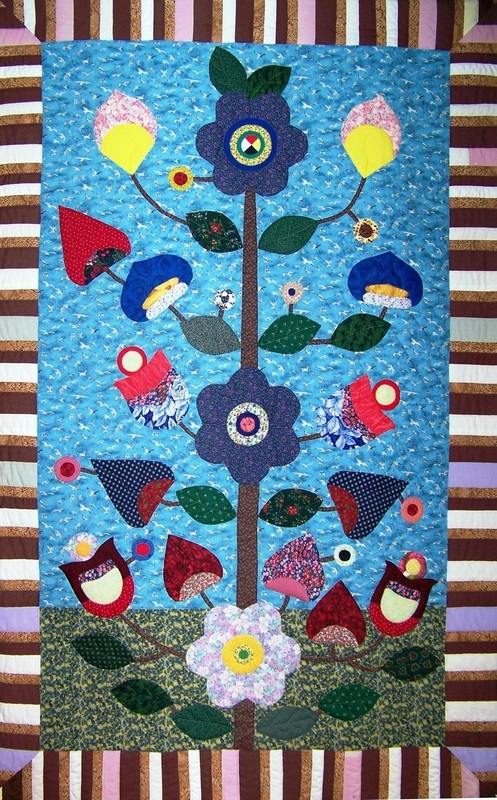 The first time I carefully looked at a quilt I was dismayed to see all those tiny, tiny stitches which covered the quilt, and wondered how anyone could even imagine finishing all that stitching, let alone really believe they could complete the quilt. True, I had done a lot of beadwork in the past and it requires working with minute beads and small stitches, but the projects are relatively small and it is easy to see an end to them. But quilts — they are so big; how can anyone imagine being able to finish one!? How can anyone even think there can be an end to it!? Ever since that first time when I inspected a quilt, and all those horrible and dreadful feelings towards the work that has to be done to complete a quilt overwhelmed me, I’d actually turn and walk away from a quilt display whenever I happened to come across one. Thinking of all that work used to make me shudder! All of my life I have loved fabrics. My mom was poor when we were small, but she managed to possess a few pieces of fabric. She made her own blouses and dresses and sewed clothes for us, her six children. I remember her gazing at some of her fabrics, fondly touching them and saying how she loved the different designs and different colours. That must have rubbed off on me because I feel the same way about the fabrics I have. As early as my high school days I have bought little bits and pieces of material. However, I couldn’t buy a lot until after I was married and settled down in my own home, for I had had nowhere to keep my possessions before. By the time my firstborn, a daughter, was one year old, I had accumulated quite a little pile of fabric. I did try using it by making myself some clothes, but I never liked the way they looked on me. I hated making curtains, or placemats, and other household items, so I made my daughter little dresses. However, I made her so many that she didn’t even get to wear a tenth of them. This was very discouraging — I just couldn’t find a way to use this beautiful material I kept buying and loved so much. At the appointed time, Debbie and I went to our first quilting class. I remember sitting around a big table and each of us being handed a small plastic bag with a couple of pieces of matching fabric and the picture and templates for the Honey Bee quilt block. The minute I handled them, I began to get excited! I couldn’t wait to get started! I always credit that moment as the time I made the connection — the discovery! — of what I could do with all the material I had been saving up. 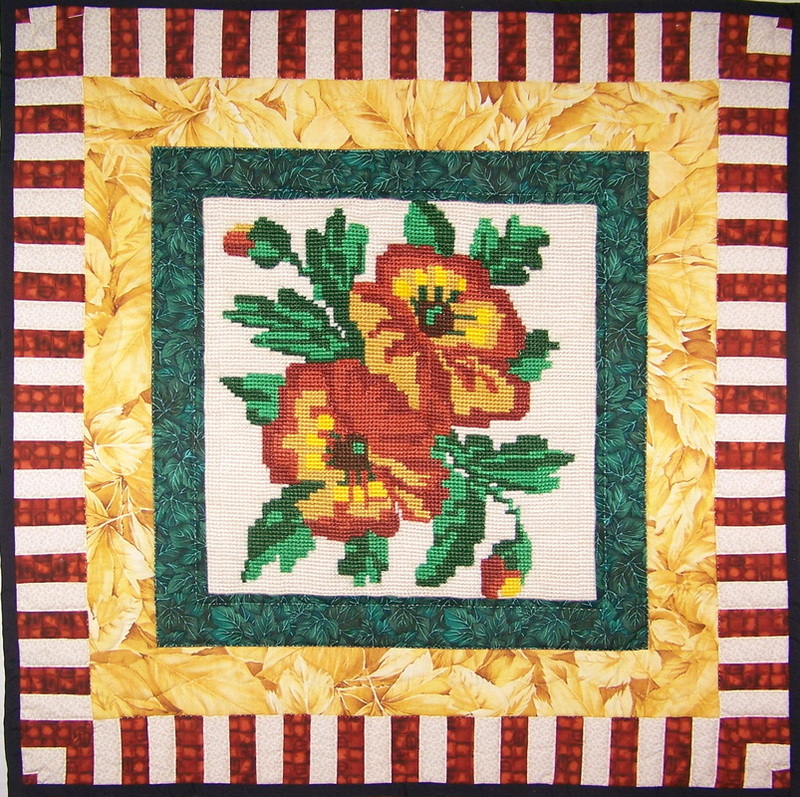 Quilting was the exciting and meaningful way for me to use it. For the next four years, I cut, put together, sewed and quilted the usual quilts, took the occasional quilt course, and joined the local quilt guilds. 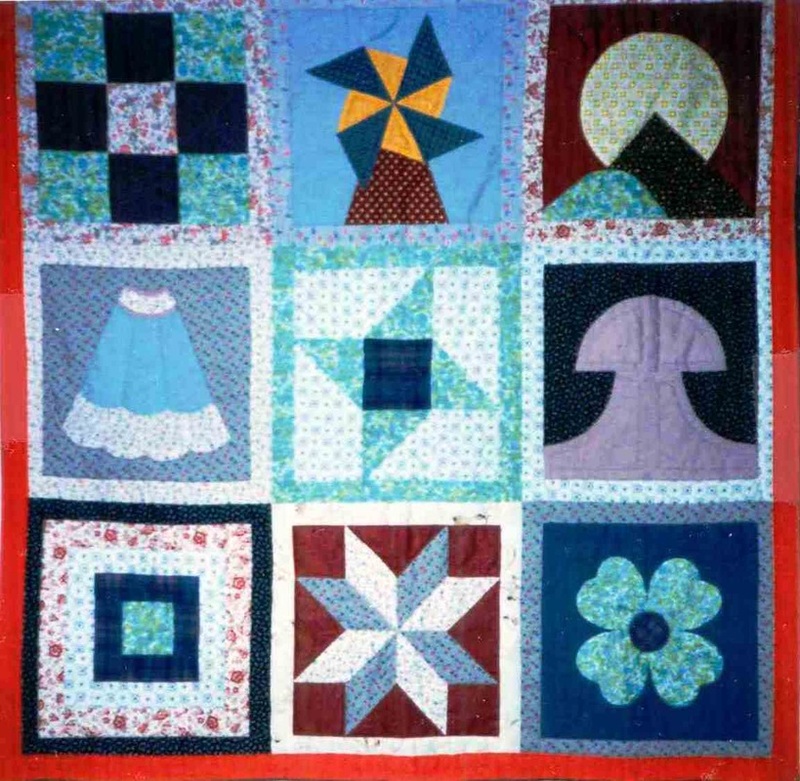 I made the conventional quilting blocks which were developed and continue to be evolved by those women and their descendants who came to this land from across the ocean. Some of these blocks are Log Cabin, Shoo Fly, Rob Peter to Pay Paul, Dresden Plate, Friendship Star and Grandmother’s Fan, to name a few. I can’t explain why, but I enjoy doing these “ordinary” blocks. The way they look appeals to me. The way they can be made to look so different just by changing some (or all) of the colours inspires me, not to mention that just giving different shapes a mere twist or turn can produce a completely different effect and, therefore, even a new block. I love putting the many colours and various shapes together to make something new. During this time I kept thinking to myself, “I really love this. It excites me, but also, it keeps me on an even keel. I love this so much that it’s going to be ‘The Me Part’ of the rest of my life,” which meant it was not something I was going to pick up and do whenever I found a bit of spare time or when I could fit it in somewhere during my days. It meant that most other things in my life were going to come second. Quilting was going to be the most meaningful connection to Life for me. Everything else would have to be squeezed in around my quilting activities—housekeeping, meals, soaps, shopping, laundry. I made up my mind I was going to treat quilting like eating: you enjoy it and you have to do it. I was given to have an Anishinaabe mother and a white father. That has shaped my life and my thinking. It has shaped how I interpret what the world is all about. I have been grateful for this double heritage. From my mother I am connected to the sacred spirit and life of this land and to the people and life who came before us. 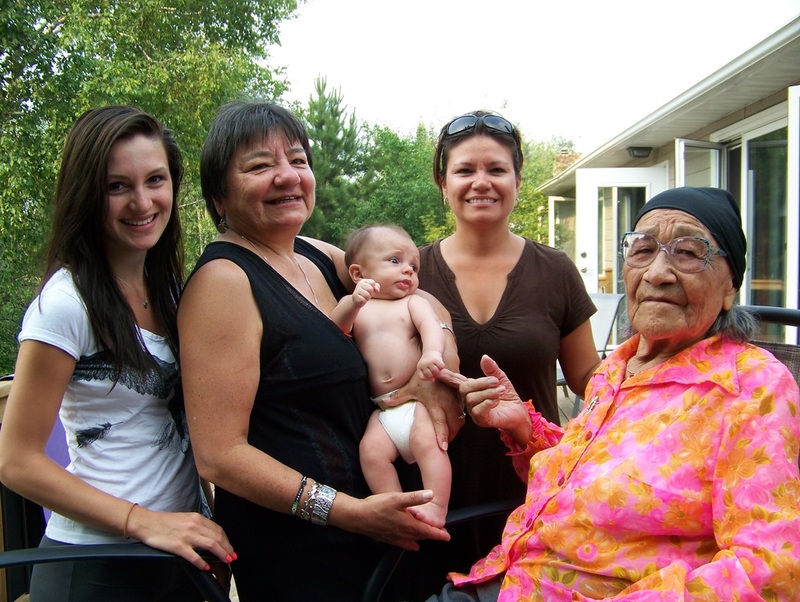 My mother gave me the core of my being, the Anishinaabe way. Traditionally, women rearing their daughters and sons have a more intimate relationship with their children than do men. Women pass down and communicate the cultural norms and values. Because my Anishinaabe mother was able to raise me during most of my formative years, the essence of my being is experienced in terms of the Anishinaabeg. From my father I was given the traditions of the white culture which would make it possible for me to live more easily in the milieu of the dominating society. Because I would one day have to go to school and live outside of the Anishinaabe ways, which was in those days essentially communal and non-competitive, my parents realized they had to prepare me to live in the culture of a racist capitalist society. My white father taught me the norms and values which I should adopt and adapt to so it would be easier for white people to accept me. These non-Anishinaabe cultural traits and behaviors I perceive as acting like clothing: they cover up my Anishinaabe self so white people are able to accept me easier and I can “succeed” or “make it” in their world better. Thinking about quilting, I realize I wanted to acknowledge my double heritage. How was I going to do this? What form would it take? What images would I use? For the next couple of years I wondered about this. Slowly, the way to do this began to take form. 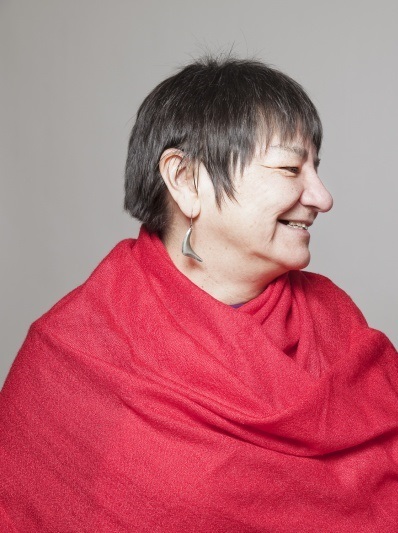 Because so many of us First Nations people are of mixed blood and want to remain faithful to our connection to the land and to all the relations who gave us being, I wanted my quilts to represent and acknowledge my double heritage. In the centre I have an Anishinaabe picture drawn in an Anishinaabe art form, such as those that are done by Anishinaabe artists like OnsaawaabikoBinesi (Norval Morisseau). If I don’t have an Anishinaabe art form, I feature birds and animals or beings which figure significantly and importantly in Anishinaabe life and culture. That’s how I show the heritage my mother gave to me — as Woman and Anishinaabe. It also honours that we First Nations people are given this great and sacred Turtle Island to love, respect, and take care of — this is our Home Land. To show the heritage my father gave me, I place those usual quilting blocks, which are done every day by quilters, either as a decoration above and below the central theme, or as a frame around it, or even both. As I was working with these art forms, I began to realize that it was Anishinaabe men’s art form that I was using. 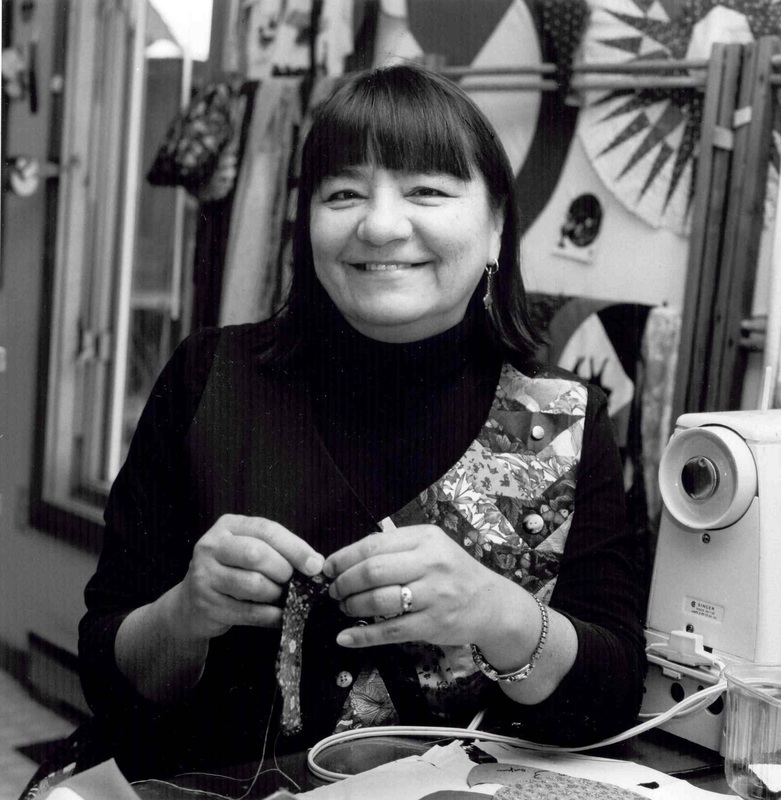 I wanted to use Anishinaabe women’s art forms—after all, I am woman and I am Anishinaabe. I should be using these art forms and showing the world about them. But then I had to wonder, “just what are Anishinaabe Kwe art forms?” I couldn’t bring up to my consciousness what it would look like; it came up empty, a blank, for me. I felt embarrassed and stupid about this. Then I began to wonder why I didn’t know. I know what men’s are, yet the Creator has given that women see and notice and interpret things differently than men do. How come I missed the boat? I didn’t know how I was going to find out without asking somebody, which would mean I would be exposing my ignorance and showing that I didn’t know a great part of who I was. All this should have been an intuitive natural part of my Being, not something I should be consciously looking for! But that desire to know was stronger then my fear and trepidation. I wanted to ask an Anishinaabe woman, but I suspected she wouldn’t know what I was talking about because she’s so connected to her Anishinaabe-wisiwin (ways) that she couldn’t understand why would I want to compartmentalize everything in my life (like white people do). When one is grounded in her culture, one doesn’t have to try to fill up any empty spaces. Also, of course, my being so reasonably well-schooled also made me think the Elders couldn’t possibly know what I was talking about. Floral and geometric. I was stunned. I did a lot of thinking about how come many of us don’t know these things. Why was it I didn’t know that when I was looking at Anishinaabe art, I was looking at our men’s art forms? Why did I have to think long and hard before I awakened to the fact that I was thinking only in terms of our men’s work? Given that many of us are influenced, schooled and socialized in a Christian, capitalist value system where women and their roles and contributions are negated, devalued, and even not acknowledged, it is no wonder that I wasn’t even aware that distinct Anishinaabe-Kwe’s cultural traits and behaviours exist. The patriarchal social structure is such that it is men’s culture that is profiled as if it were the only valid and viable way of thought, language, action and life. That is why I had to dig so hard to find out what was right in front of me. Again, it’s in my genes that I would know these things, but women things are learned out of our consciousness, both individually and collectively. I began to realize, “Yes. All my life I have watched my mother do her art work in different media—beads, embroidery floss, threads of different colours and textures, birch bark, furs, roots, skins and leathers. In a lot of this work she uses floral and geometric designs. To top it all off, I too have done beadwork using geometric designs and have taught my children these things. And I never realized this was women’s art form. Nevertheless, I was overjoyed that I now had a handle on it. This is the point at which I started to make the center of my quilts floral, taking the designs from the beadwork, quillwork, embroidery, birch bark biting and moose hair tufting. Now I am able to do Anishinaabe women’s art forms also in my quilts, and show the world this is one of our life and art ways. I am thankful for Debbie Jacobs for dragging me to that first quilt course. I am also thankful for the heritage and skills which my mother and father each gave me. In many ways, my four children have helped me, but one of their biggest contributions to my work is that they did the everyday household chores which allowed me to spend more time and energy on my art. Even though my three grandchildren are still small, somehow they inspire me and give me great joy. I can’t list off all the ways my husband has helped me, but his greatest gift is that he meets a lot of my construction needs, like making shelves and other storage space. Because I don’t like the way I draw, he and our son, Keesic, have helped me to draft out some of the images I transfer onto fabric. Norman Knott, a well-known artist from Curve Lake, was the one who first shared his Anishinaabe art forms with me. Because of his kindness and willingness to share, I was able to make a beginning in the distinctive way that I do my work. I hope that, through my quilting, I have been able to make a positive and significant contribution to people’s understanding of Anishinaabe ways and how we see life, for in the end, this is the only way the Earth and all Life can be saved.